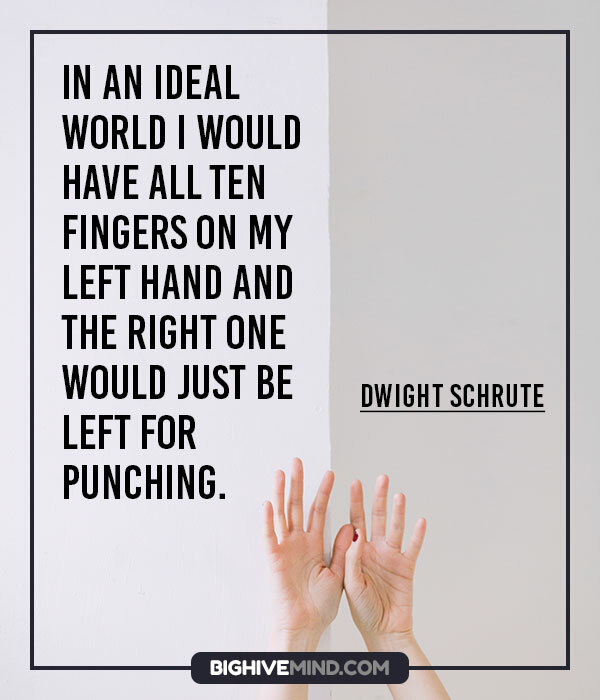 Assistant to the regional manager of Dunder Mifflin, salesman, and B&B proprietor of Schrute Farms beet plantation, Dwight K Schrute may not have tact (or any other social skill), but he never lacks wisdom. 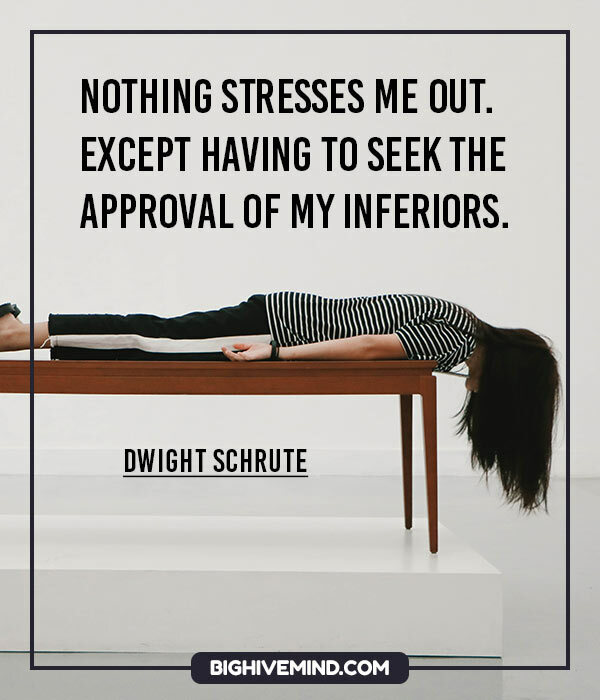 There’s hardly a subject on which Dwight Schrute doesn’t have an opinion, from the martial arts to table tennis to Judge Judy to the 1987 Pontiac Trans Am. 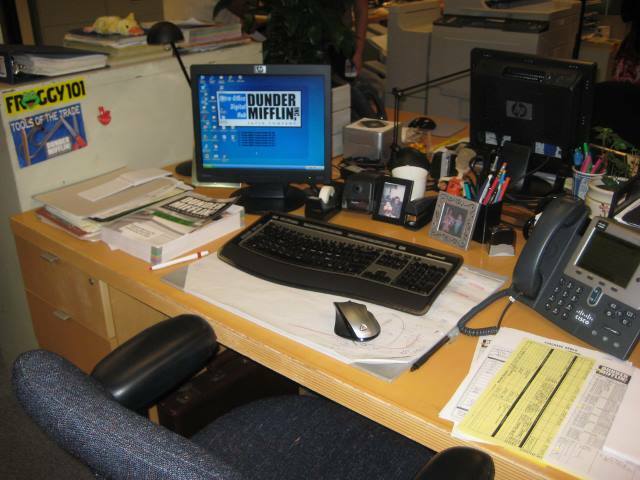 The Office’s favorite sidekick is funny even when he doesn’t mean to be, and what he lacks in common sense and pop culture knowledge he makes up for in...something. We don’t quite know what makes this character tick, but whatever it is, it makes for some memorable quotes. Once I’m officially Regional Manager, my first order of business will be to demote Jim Halpert. So I will need a new number two. My ideal choice? Jack Bauer. But he is unavailable. Fictional. And overqualified. People learn in lots of different ways, but experience is the best teacher. You’re PMS’ing pretty bad huh? If I could menstruate, I wouldn’t have to deal with idiotic calendars anymore. I’d just be able to count down from my previous cycle. Plus, I’d be more in tune with the moon and the tides. Bread is the paper of the food industry. You write your sandwich on it. 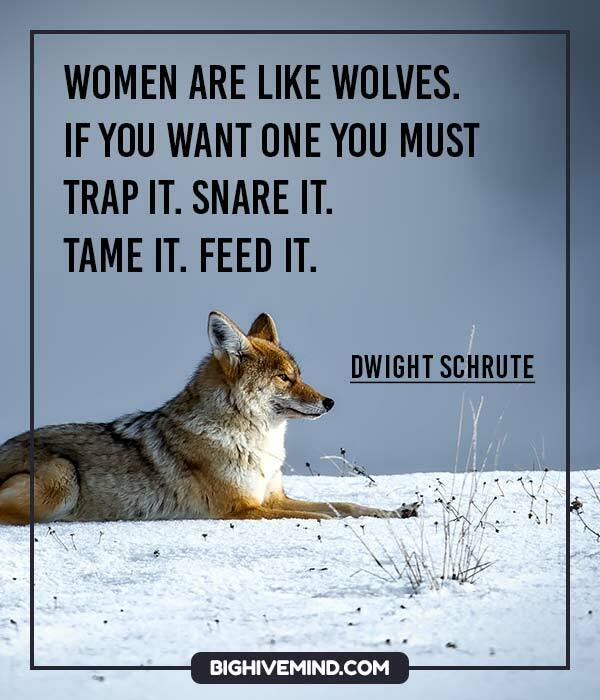 Women are like wolves. If you want one you must trap it. Snare it. Tame it. Feed it. I always wondered how they picked the person to die. I’d be good at picking the person. I don’t care what Jim says, that is not Benjamin Franklin. I am 99% sure. I don’t have a lot of experience with vampires, but I have hunted werewolves. I shot one once, but by the time I got to it, it had turned back into my neighbor’s dog. Learn your rules. You better learn your rules. If you don’t, you’ll be eaten in your sleep. Through concentration, I can raise and lower my cholesterol at will. When my mother was pregnant with me, they did an ultrasound and found she was having twins. When they did another ultrasound a few weeks later, they discovered that I had adsorbed the other fetus. Do I regret this? No, I believe his tissue has made me stronger. I now have the strength of a grown man and a little baby. Dolphins get a lot of good publicity for the drowning swimmers they push back to shore, but what you don’t hear about is the many people they push farther out to sea! Dolphins aren’t smart. They just like pushing things. I am fast. To give you a reference point I am somewhere between a snake and a mongoose And a panther.I am fast. To give you a reference point I am somewhere between a snake and a mongoose And a panther. And I will travel to New Zealand. And walk the Lord of the Rings trail to Mordor. When I die. I want to be frozen. And if they have to freeze me in pieces, so be it. I will wake up stronger than ever, because I will have used that time, to figure out exactly why I died. And what moves I could have used to defend myself better now that I know what hold he had me in. I overslept. Damn rooster didn’t crow. I grew up on a farm. I have seen animals having s*x in every position imaginable. Goat on chicken. Chicken on goat. Couple of chickens doing a goat, couple of pigs watching. I love catching people in the act. That’s why I always whip open doors. Would I ever leave this company? Look, I’m all about loyalty. In fact, I feel like part of what I’m being paid for here is my loyalty. But if there were somewhere else that valued loyalty more highly, I’m going wherever they value loyalty the most. Powerpoints are the peacocks of the business world; all show, no meat. Those who can’t farm, farm celery. I am faster than 80% of all snakes. Why are all these people here? There are too many people on this earth. We need a new plague. What is my perfect crime? I break into Tiffany’s at midnight. Do I go for the vault? No, I go for the chandelier. It’s priceless. As I’m taking it down, a woman catches me. She tells me to stop. It’s her father’s business. She’s Tiffany. I say no. We make love all night. In the morning, the cops come and I escape in one of their uniforms. I tell her to meet me in Mexico, but I go to Canada. I don’t trust her. Besides, I like the cold. Thirty years later, I get a postcard. I have a son and he’s the chief of police. This is where the story gets interesting. I tell Tiffany to meet me in Paris by the Trocadero. She’s been waiting for me all these years. She’s never taken another lover. I don’t care. I don’t show up. I go to Berlin. That’s where I stashed the chandelier. I signed up for Second Life about a year ago. Back then, my life was so great that I literally wanted a second one. Absolutely everything was the same…except I could fly. Always the Padawan, never the Jedi. In the wild, there is no healthcare. Healthcare is Oh, I broke my leg!_x009d_ A lion comes and eats you, you’re dead. Well, I’m not dead, I’m the lion, you’re dead! Of course Martial arts training is relevant… Uh, I know about a billion Asians that would beg to differ… You know what, you can go to hell, and I will see you there. Burning! It’s never the person who you most suspect. It’s also never the person you least suspect since anyone with half a brain would suspect them the most. Therefore, I know the killer to be Phyllis… The person who I most medium suspect. The principle is sound. To avoid illness, expose yourself to germs, enabling your immune system to develop antibodies. I don’t know why everyone doesn’t do this… Maybe they have something against living forever. Before I do anything I ask myself, ‘Would an idiot do that?’ and if the answer is yes, I do not do that thing. I come from a long line of fighters. My maternal grandfather was the toughest guy I ever knew. World War Two veteran killed twenty men and spent the rest of the war in an Allied prison camp. My father battled blood pressure and obesity all his life. Different kind of fight. All you need is love. False. The four basic human necessities are air, water, food, and shelter. As a volunteer Sheriff’s Deputy I’ve been doing surveillance for years. One time I suspected an ex-girlfriend of mine of cheating on me, so I tailed her for six nights straight. Turns out… she was. With a couple of guys actually, so… mystery solved. Yes I have acted before. I was in a production of “Oklahoma!” in the 7th grade. I played the part of Mutey the Mailman. They had too many kids so they made up roles like that. I was good. I did not become a Lackawanna County volunteer sheriff’s deputy to make friends. And by the way, I haven’t. My feelings regenerate at twice the speed of a normal man. Did you know that the human thumb is formed by 15 interchangeable joints? Wrong. Don’t believe everything that people on television tell you. There are 3 things you never turn your back on: bears, men you have wronged, and a dominant male turkey during mating season. I do not fear the unknown. I will meet my new challenges head-on, and I will succeed, and I will laugh in the faces of those who doubt me. Trust me, you are going to want to heeeeeat, my words. Reject a woman, and she will never let it go. One of the many defects of their kind. Also, weak arms. Why tip someone for a job I’m capable of doing myself? I can deliver food. I can drive a taxi. I can, and do, cut my own hair. I did however, tip my urologist, because I am unable to pulverize my own kidney stones. As a farmer I know that when an animal is sick sometimes the right thing to do is put it out of it’s misery. With the electricity we are using to keep Meredith alive we could power a small fan for two days. You tell me what’s unethical. D.W.I.G.H.T – Determined, Worker, Intense, Good worker, Hard worker, Terrific. I saw Wedding Crashers accidentally. I bought a ticket for “Grizzly Man” and went into the wrong theater. After an hour, I figured I was in the wrong theater, but I kept waiting. Cuz that’s the thing about bear attacks… they come when you least expect it. A real man swallows his vomit when a lady is present. I am not a security threat. And, my middle name is Kurt, not Fart. When held over heat, the invisible ink will reveal that everyone should meet at the warehouse immediately. Do not ask me where I got the invisible ink. [proudly] Urine. It was urine. I never smile if I can help it…. Showing one’s teeth is a submission signal in primates. When someone smiles at me, all I see is a chimpanzee begging for its life. The problem, Jim, is that people who are really suffering from a medical condition won’t receive the care they need because someone in this office is coming up with ridiculous stuff. Count Choculitis….Why did you write that down, Jim? Is it because you know I love Count Chocula? When you become close with someone, you develop a kind of six sense. You can read their moods like a book. Right now the title of Michael’s book is ‘Something Weird Is Going On… colon… What Did Jan Say?’ The Michael Scott Story. 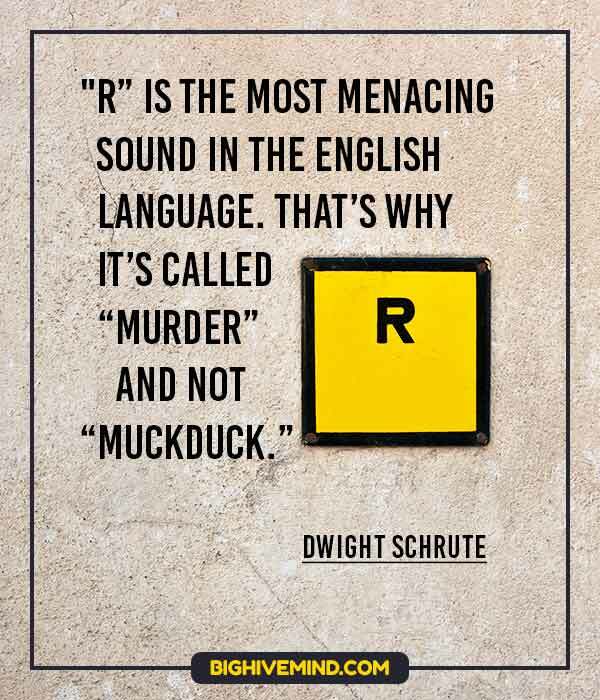 By Michael Scott with Dwight Schrute. Michael is like Mozart, and I’m like Butch Cassidy. You mess with Mozart and you’re gonna get bullet in your head, courtesy of Butch Cassidy.